Currently working on Inglewood Stadium is Pan-Pacific Project Manager, Ezequiel (Zeke) Cantoni. Zeke has worked in the plumbing industry for 16 years and in the field for 12. He has been with Pan-Pacific since September, 2014, and contributed to jobs like LAX Terminal 2, Waldorf Astoria, and the Marine Corps Logistic Base Dynamometer in Barstow, CA. 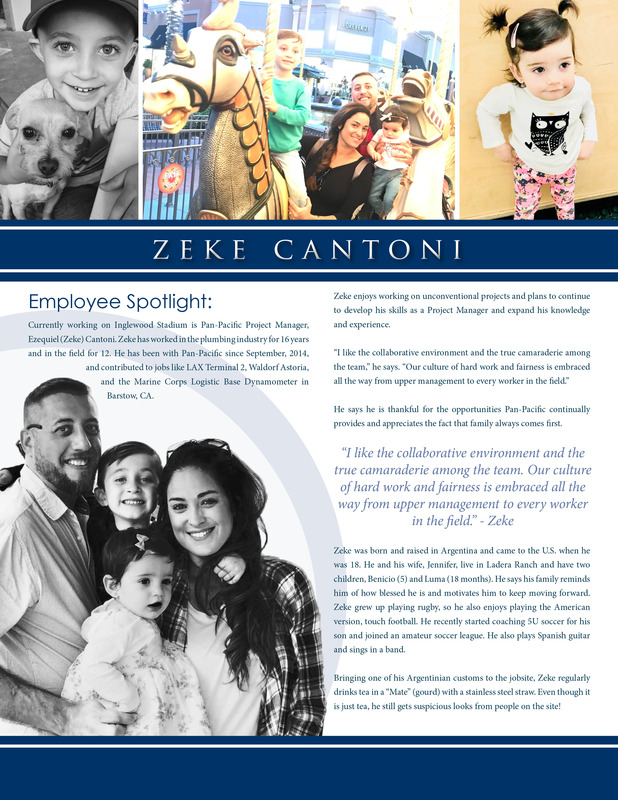 Zeke enjoys working on unconventional projects and plans to continue to develop his skills as a Project Manager and expand his knowledge and experience. He says he is thankful for the opportunities Pan-Pacific continually provides and appreciates the fact that family always comes first. Zeke was born and raised in Argentina and came to the U.S. when he was 18. He and his wife, Jennifer, live in Ladera Ranch and have two children, Benicio (5) and Luma (18 months). He says his family reminds him of how blessed he is and motivates him to keep moving forward. Zeke grew up playing rugby, so he also enjoys playing the American version, touch football. He recently started coaching 5U soccer for his son and joined an amateur soccer league. He also plays Spanish guitar and sings in a band. Bringing one of his Argentinian customs to the jobsite, Zeke regularly drinks tea in a “Mate” (gourd) with a stainless steel straw. Even though it is just tea, he still gets suspicious looks from people on the site!